Re re-boot I'll believe it when I see it. IMHO Kevin Spacey would make a good Bester. Oh yes. I think Spacey would LOVE the show if he watched it all the way through to research Bester. I think he would LOVE Bester and the character would get more of the recognition he deserves for being one of the best villains of all time. I don't think people realize that television had very few, if any, villains on the level of Bester before Bester. What I mean by that is that having watched A LOT of television I think I can safely say that there are few villains in TV history prior to Bester that were as multi-layered and complex as Bester. Also in the way Bester was used in the show. One episode he is the evil scoundrel; the next episode he is the evil scoundrel the heroes have to work with; the next episode he is the evil scoundrel who is actually doing something good and all the while he thinks he is the hero. It is an amazing thing to watch. I only wish we had seen more of him back then. I think Zachary Quinto would also make a lovely Bester... Sylar 2.0. I think Quinto would make a different Bester just from the stand point of age. Quinto is at an age where he can still play naive. He can also play someone with a certain maturity, but there is still a chance for him to seem naive. I think Spacey, like Koenig, brings an automatic level of maturity. What I mean is that you could look at Quinto as Bester and say that he is at an age where his actions, thoughts, and perceptions might be being manipulated. When you see Spacey or Koenig you know that if they have been manipulated that it has taken firm root and become who they are and that they are less likely to change or that they know more of what they are doing and they have obviously accepted it. Seeing someone Quinto's age might make an audience feel they could still be changed or have a change of heart. I don't know if any of this makes sense, but I hope you get my meaning. I know Quinto isn't particularly young, but he appears physically younger by comparison. If B5 would ever get a big budget movie I would want a younger cast (not too young though)... then there's a higher probability of a sequel or some other form of continuation. Bester could be portrayed by someone of any age because he's just a teep/psi cop, no job experience required, he was born/will live/and most likely die one day for or because of the corps. A younger Sheridan and or Sinclair would be awesome... Do a Dilgar War movie. Establish some new EA officer/characters, they could have the remaining cast members from B5 play older/high up people in the Earth Alliance/Minbari Federation/Narn Regime/& Centauri Republic... then get the Mibari war going. Younger Delenn, G'Kar, Mollari, Sheridan, Sinclair, Garibaldi, Franklin, Ivanov, Ivanova (make 'em twins, and put them in Sinclair's squadron. They could be freakin high school freshman tapped for military service.) Initially establish the Minbari as the bad guys, show how desperate the Earth/Mibari war was. No hope, kill half the cast... and then have Sinclair smash his fighter into a Minbari ship, half kill him, scar him up, get Valen some war scars... start this beautiful B5 rebirth off right. Hell, you could even merge Sheridan AND Sinclair into one character. Then redo the show. Feel free to recast whoever since there will be a time gap as B1 through B4 are built and lost. Give us a 10 season story arc this time. Last edited by Demonn; June 14th 17 at 17:04. Mix it up a bit. Bruce Boxleitner as Dukhat (edit) or Lenonn... Mira Furlan as the female Earth Alliance President. Last edited by Demonn; June 14th 17 at 17:03. 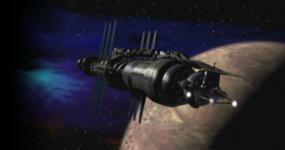 A reboot would be great, the Babylon 5 story in general is very much a story of today's times. The biggest problem I see is that we have no originality in our entertainment anymore. Most of what I watch is BBCA or House of Cards (the only Netflix show I actually watch now that Sense8 is cancelled). More of Star Trek, Aliens/Prometheus, and comic book adaptations is all I fear our movie market will consider. Maybe JMS should make a pitch to the BBC to make a Canadian production. Orphan Black is definitely original. And Mr. Robot was taking a huge chance, but USA was willing to take a chance on a basically cerebral story. I'm not even sure who is real on that show. Now THAT's good science fiction. Have the last of the Dilgar (Deathwalker & friends) join the Shadows. Introduce G'Kar as a pirate/smuggler. The Narn Regime supplied us with Centauri weapons yes, but go two further and have G'Kar selling/supplying us weapons on his own. Make him a popular Resistance fighter among the Narn who scrapped together his own ship and does what he wants. He could either join in the battle of the line (with the EA) or he could be smuggling people off world while the battle rages. He could have either motivation for helping, profit, or just because it's right. His ship could be just a little thing with a 2 or three person crew. Get him a bodyguard and maybe a pilot. He could then be named ambassador to B5. Later on in the show you could have him smuggling Narns off the homeworld and then sneeking back to B5. Have a worldwide draft on Earth to fight the Minbari... establish that even though they cut through Human ships like butter it is possible to combat them with fighters. Weapons don't lock on to their ships but manual targeting works just fine, all starfuries are loaded to the max with rockets. Turn it into a human fighter vs minbari capital ship war. Sinclair/Sheridan could become Star-Killer at the battle of the line when he flies into the Minbari flagship. What changed your mind about a reboot? I've tried introducing B5 to many of my younger friends and friends' kids who have reached their teenage years, and none of them took. They like Doctor Who, the new Battlestar, DS9, and other new sci-fi, but they don't like early TNG or B5. Too "staged," they say. Too theatrical. The CGI is "corny" or "low budget," which we all know it wasn't at the time. Is it still my favorite sci-fi of all time? Absolutely. But I grew up with it at the age most of them are now. I suffered through the months between seasons and the uncertainty of each following season even airing at all. B5 was a game-changer as far as CGI, plot and character development goes. I am absolutely in support of a reboot, with JMS having full creative control. There were some things Ron Moore did with BSG that I thought weren't necessary. I would want JMS to have that control without having to write all of the scripts, which damn near killed him the first time. JMS is B5's Roddenberry, just not as kooky. RW - good to see you too! I don't know if it would impact us here, but there's a guy named Mark Oshiro who, due to a strict upbringing, did not watch a lot of shows growing up that many of us have. He's currently finishing up the various Star Trek series (he just recently started Enterprise. He tweeted out his plans for after Star Trek. He's first going to do a palate cleanser and watch the 5 seasons of Alias and the first season of Yuri On Ice. And then... Babylon 5. Given that he won't be through with Star Trek until November and will be doing several seasons of other shows before getting around to B5, it might not be until this time next year that he finally starts, but it's often interesting to see his thoughts on shows. I read along when he did the Buffy the Vampire Slayer and Angel series several years ago; I found out about this guy when someone had posted on another forum about his having watched and commented on Avatar The Last Airbender. It's always fun to follow with someone when they watch a show I like for the first time, so I'm excited he's going to do B5, even if it's some time away. Last edited by vacantlook; June 20th 17 at 20:24. It really is good to see new fans coming to a show that hasn't been given decent exposure in decades.